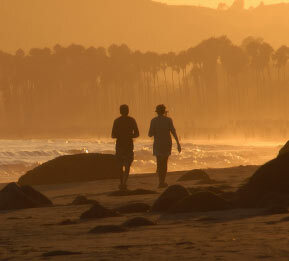 and be in love in Santa Barbara. and be happy in Santa Barbara. and be free in Santa Barbara. Santa Barbara Vacation Rentals offers you the finest assortment of luxury vacation rentals and beach rentals in Santa Barbara and surrounding areas. Whether you are looking for a fun vacation rental for a week-long family reunion, a quiet beachfront retreat, or a romantic getaway, the ultimate vacation experience awaits you in sunny Santa Barbara, the American Riviera. Our comfortable, charming, fully furnished vacation rentals provide you with a true home-away-from-home and each property is close to all Santa Barbara has to offer. Allow us to help customize your Santa Barbara vacation rental with the amenities most important to you – breathtaking ocean views, outdoor dining, private beach picnics, cozy indoor and outdoor fireplaces, state-of-the-art spa baths and home entertainment are just some of the features available. Contact us today to learn more or book your stay.